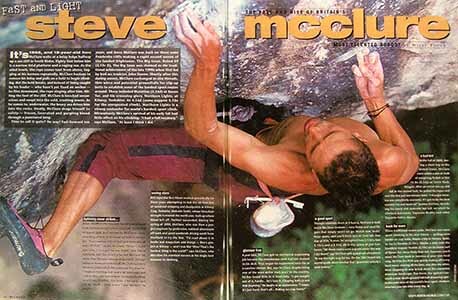 Since before the Millenium Steve has been writing for the climbing press, initially with articles in High Magazine and the classic On The Edge. 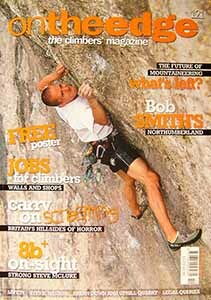 In March 2005 Climb Magazine was introduced in the UK and Europe, including a monthly column written by Steve. This column remained an integral part of the journalism for the magazine for it's entire life span. Climb Magazine has now ceased publication, after 140 issues. Steve is well known for his individual style of writing, and is capable of engaging the reader on a personal level and with a dry sense of humour. With free rein to write, Steve has covered a huge number of topics from the latest training to Christmas stocking fillers, from hot new destinations to climbing legends and just about everything in between. As well as working with UK magazines Steve has also had articles published in many other UK hardcopy productions, and also in many of the leading outdoor websites. To date he has had well over 500 pages of published text.